Tostados used to be a way of using up stale tortillas. 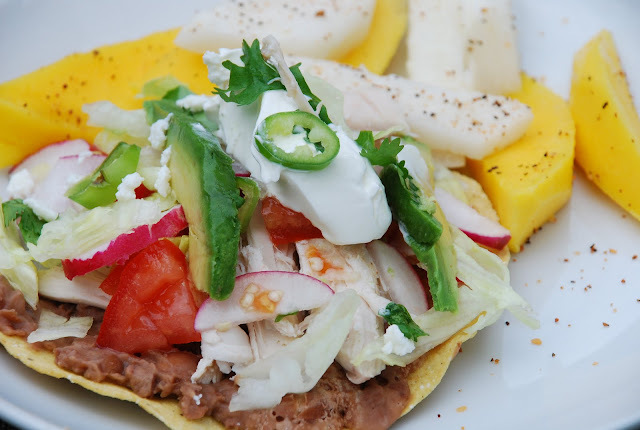 Tostado recipes are now so good, people simply started using fresh tortillas to make them. Again, I like the mini ones…portion control. Here is a simple recipe and make sure you use nothing but the best and freshest ingredients because it will make all the difference. Tostados are great for a summer meal when you’re simply not in to cooking. In this case, we use rotisserie chicken so we didn’t have to cook at all – which was great because it was finally a hot and sticky summer day here in Chicago. Fry and drain the corn tortilla. Spread on a layer on of refried beans. Place chicken on top of the refried beans. Pile on the other ingredients using as much or as little as you want. Garnish with homemade red salsa or salsa verde. Serve with a cold margarita.